Racoons are notorious for scavaging trash cans and compost piles, but they can also invade garages, sheds, and homes in rare instances. Because racoons carry disease, it is important to remove them from your property. 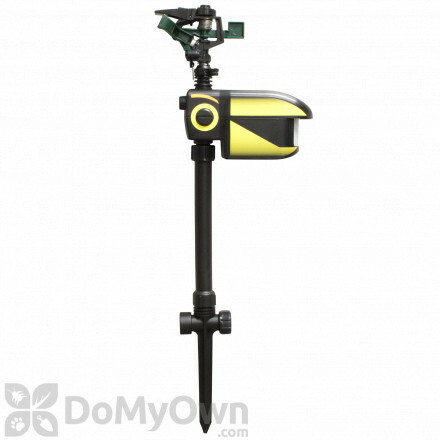 Our traps and repellents will help you safely remove racoons from your yard and keep them away. An excluder with One Way Door for skunk, feral cat, raccoon & similar sized animals. 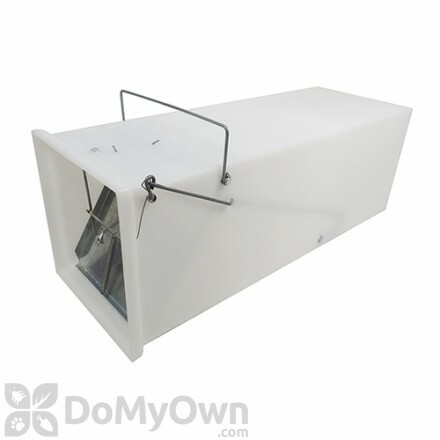 A live plastic trap for raccoons, feral cats, woodchucks and similar sized animals. 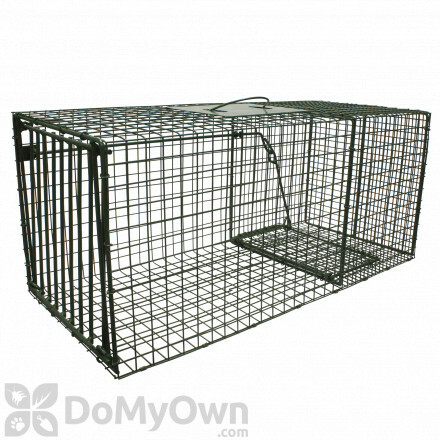 A live trap ideal for wild animals like raccoons, cats and armadillos. 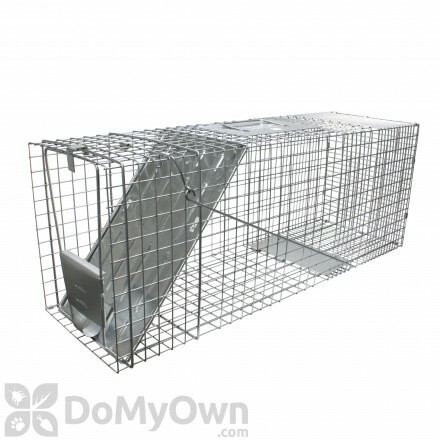 Trap for racoon, oposssums, rabbits, armadillos, groundhogs and ferral cat sized animals. Features easy release rear door. A Original Series Rigid Trap with One Trap Door and Easy Release Door for raccoon, feral cat, badger, woodchuck, armadillos & similar sized animals. 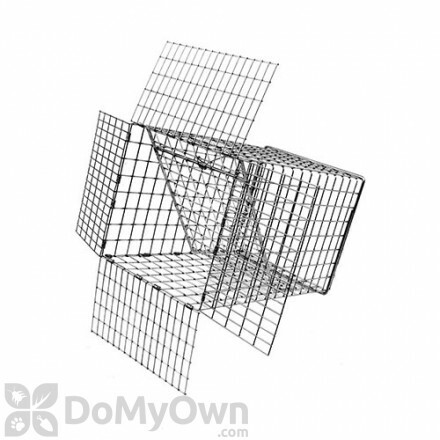 (Same as model 608 except with 1" x 1" - 12 gauge wire mesh). The deluxe animal control pole features an aluminum wall that is almost twice as thick as the standard pole for increased durability. A raccoon specific nose cone which helps catch raccoons easily. Raccoons are usually found in wooded areas near lakes, streams, and rivers, but since they are so adaptable, they often make their homes in urban and suburban areas just as easily. Now what do raccoons eat? Well… Raccoons are omnivores; so they like to eat fruits, berries, nuts, acorns, corn, and grains, crayfish, clams, fish frogs, snails, insects, rabbits, muskrats, and eggs. When these are not available, they’ll scavenge in garbage cans and compost piles, eat pet foods, etc. Raccoons are not picky eaters. Some other raccoon facts include: raccoons find backyards, alleys, and neighborhoods very enticing because they offer food and shelter with little effort on the raccoons’ part. Suburban raccoon populations can quickly become very large because of the accessibility of food and shelter. These animals are clever and strong, and if a mother raccoon is nursing young, she can be very aggressive. Raccoons are known to knock over garbage cans, create dens in chimneys, tear off shingles and fascia to enter homes, can enter and destroy attic and wall space, and also damage gardens and fruit trees. They are not only destructive, but also clever, known to unlatch fences and open bins and containers. Raccoons can also carry diseases. Raccoon feces can carry roundworm eggs, and can carry ticks, fleas, lice, and mange, and rabies. Another burning question a homeowner might have; are raccoons dangerous to humans? While raccoons are generally docile and curious, they can be dangerous to humans. If a raccoon is carrying rabies or any diseases, or has recently had babies, you need to stay clear. For those who are unfortunate enough to have to ask themselves the question; how do I get rid of a raccoon? There is no easy answer since they are clever, strong, and adaptable. Raccoons can be tricky to manage and it can be hard to know how to keep raccoons away. Habitat modification and exclusion are the best options for raccoon control. Secure garbage can lids and secure cans to a post or structure to ensure that the raccoons cannot tip the cans over. Never keep pet food outdoors over night. Pick up any fallen fruit or nuts in your yard frequently. Thin out foliage to reduce cover. Reduce roof access (raccoons love to nest in attics) by trimming trees at least two feet from your home. Trellises and arbors can provide roof access, so consider removing these if you have a raccoon problem. Ordinary fences without reinforcement will not be effective against keeping raccoons out, as they are good climbers and diggers and can unlock simple latches. You can install an electric component to your existing fence to keep raccoons out or reinforce the top and bottom with fine wire mesh. Mesh should extend a foot into the ground, extending a foot away from the home. Install a chimney cap to make sure raccoons cannot create nests inside. Any spaces under decks, steps, and porches should be filled or blocked with fine wire mesh, buried about a foot down and a foot away from the structure. Frightening materials and gadgets designed to scare away wild animals have been found to be generally ineffective against raccoons because they get used to the device and learn that the device is harmless and is will only act as a deterrent for a short time. Raccoon repellents, usually containing eggs, garlic, and hot peppers designed to make plants foul tasting and smelling to wildlife, don’t repel raccoons. They quickly become used to the taste and smell. Trapping raccoons can be a viable option, especially if you are comfortable with trapping and the animal is in a structure. Raccoon bait could be nearly anything mentioned earlier. Live raccoon traps, or any properly sized trap, can work well to capture the animal for release. However, it can be dangerous to trap a nursing mother raccoon or a rabid raccoon; she will get very aggressive and defensive and the young will be in jeopardy. 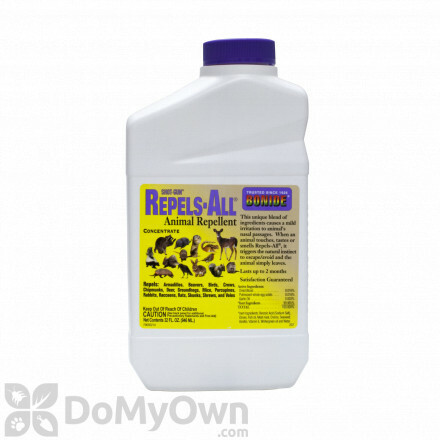 Wild life control agents can assist you in raccoon removal if this is the case. If you choose to trap, always check the laws in your area. Often times, trapping and relocating raccoons is illegal without permits or licenses. There are no registered poisons for raccoons.